On a cool (cold?) and rainy Friday morning we pulled into Dijon and found a parking spot fairly quickly. 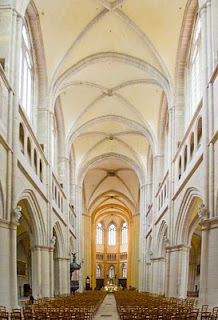 Dijon is the capital of the Côte-d'Or department in the Bourgogne region of east central France, with about 150,000 inhabitants within the city limits. In Celtic times, tin merchants from Britain who traded with Adriatic communities, followed their route along the Seine river, passing through what was to become Dijon, before crossing the Alps into what is now Italy. A settlement called Divio was developed on this site during the Roman period, consolidating the route between Paris and Lyon. About 1000 CE, Dijon was chosen as their capital city by the dukes of Burgundy, although it wasn't until the 14th and 15th centuries that the city blossomed into its greatest prosperity. Dukes Philippe le Hardi (Philip the Bold), Jean sans Peur (Jean the Fearless), Philippe le Bon (Philip the Good), who actually sold Joan of Arc to the English, and Charles le Téméraire (Charles the Bold) were the guiding hands leading to this success. Dijon lost its capital status however, in 1477 when it was incorporated into the kingdom of France. More recently, the city was occupied by Nazi Germany from June 1940 to early 1945, when it was liberated by the Allies. Dijon of course, is synonymous with mustard. Moutarde de Dijon however, refers only to a manufacturing method for a particular strong mustard relish, a recipe for a genericized product. For Dijon mustard that is actually produced in Dijon, 90% of the mustard seed is actually imported, much of it from Canada. Click here for a flavor of this comfortable French city. 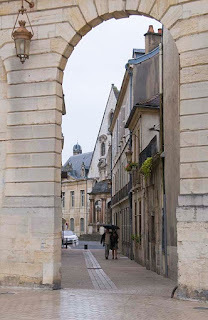 Beaune was a convenient stopover on our trek north, having a campsite just outside of town and a map footprint suggesting a walled city with plenty to Ooh and Ah about. With a population of 22,000, Beaune is the principal town in the Côte-d'Or department of the Bourgogne, or Burgundy region of central France. The city center is focused around the irregularly shaped Place de la Halle that bustles with restaurants and a variety of stores. 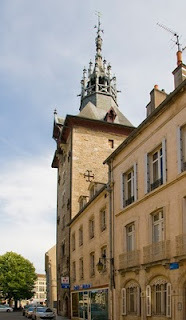 The town's major claims to fame are the 15th century Hôtel-Dieu hospital and the wine auctions, among the largest in France and certainly the major conduit for all varieties of Burgundy. Each Saturday morning there is a large market in town with a smaller one being held each Wednesday. The wine industry is the major element of Beaune's economy although tourism is also significant. It is probable that the area around Beaune has produced wine since 300 CE and, in the middle ages, the industry was largely taken over by the Catholic church who discovered that Pinot Noir and Chardonnay grapes flourished in the various micro-climates of Burgundy.About half of the defensive battlements, ramparts and moat are extant and these are well maintained. Other features include a 12th century clock tower and the 15th century Romanesque/Gothic Notre Dame church. For more on these features, click here. On September 3rd, 1939, France declared war on Germany the day after the German invasion of Poland. That done, France then appears to have dusted off its hands in a smug sort of "That'll fix their wagon" way and continued with life as usual, feeling confidently unassailable behind their vaunted Maginot Line. Eight months later however, the Germans attacked, crushed the northern end of the the Maginot Line in Belgium and, within a month, overran France. The Germans chased the quickly diminishing remnants of the French government further and further south until the WWI hero, Marshall Philippe Pétain, who was vice-premier at the time, convinced his colleagues to capitulate. After a quick armistice with the Germans, Pétain went on to negotiate a collaborative puppet government with himself as leader. Another triumph of French ingenuity! The upshot of this was the de-facto dissolution of the Third Republic of France with the country being renamed simply the French State (of Germany, that is). At the same time, the cherished national mantra, Liberté, Egalité, Fraternité (Freedom, Equality, Brotherhood), adopted after the Revolution, was replaced with the drab, German approved phrase, Travail, Famille, Patrie (Work, Family, Fatherland). The Vichy government thus created, was to preside over the 40% of France that was now German territory but was not occupied, and also provide administrative services for the occupied area, only to the extent that there was no conflict with German law. The runaway government had already fled as far as Bordeaux, in the unoccupied (and strategically unimportant) southern 40% of the country, and Vichy was selected as the new seat of authority. Being the second largest city in the Auvergne region and having a large telephone exchange were doubtless factors in this choice.For more than four years, Pétain and the Vichy regime, willfully and quite thoroughly collaborated with the German occupation, including support for eclectic "ethnic cleansing" and the vigorous persecution of the French Resistance. The latter was an overt, if low level, civil war that had festered in one form or another since the Revolution 160 years earlier.As events unfolded, a couple of years into the regime, when the allies began to threaten southern Europe through their invasion of north Africa, Germany brought the rest of France under occupation. Meanwhile, General Charles de Gaulle, universally despised and mistrusted by all the senior Allied leaders, worked first from London and later from North Africa, claiming to represent the legitimate continuance of the real French government in exile. Following the Allies' invasion of France in June, 1944, de Gaulle proclaimed the Provisional Government of the French Republic and installed it in Paris after its liberation, in August of the same year. The Third Republic was thereby briefly resurrected. Simultaneously, Vichy's officials moved to Sigmaringen in Germany to establis h their own government in exile which existed until April 1945. Many of the Vichy regime's prominent figures were subsequently tried in France and a number were executed. In all, the Vichy government endured from July 1940 until October 1944. 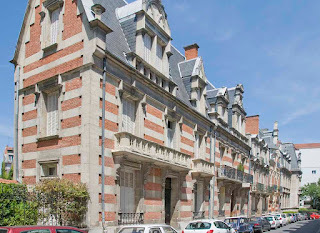 Today, to a casual observer, the nature, purpose and future of Vichy appear quite clouded. Without a doubt, the city continues to be sadly and unfairly stigmatized by the nature of its role in WWII and, with little industry in the area, appears to be struggling to revive its Hydrotherapy, curative waters mystique that had served it well since the time of the Romans. Changing public mores, burgeoning regulations, improved access to critical information and a grab bag of quack remedies in every corner pharmacy seem likely to push this dream out of reach. More views of this tainted town here. From Salers, our route headed east into the Parc Naturel Régional des Volcans d’Auvergne, a near one million acre park established in 1977. At its highest point, the park is a little over 6000 feet and claims to offer glaciers(? ), lakes, peatlands and, obviously, volcanoes in its interior. The roads across the area are desolate, narrow, and often steep and winding - steep enough that in one area we were constrained to first gear for a three mile stretch. The terrain that we passed through ranged from green sloping areas, pockmarked with rocky craters, to lunar looking regions with spires of volcanic rock jutting hundreds of feet in the air. These needles, we learned, are called puys. 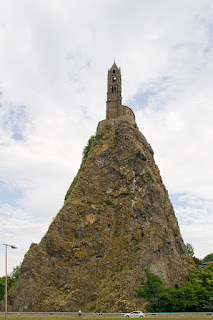 Our destination was Le Puy-en-Velay, a city of around 21,000 folk, east of the park in the Haute-Loire department of the Auvergne region. 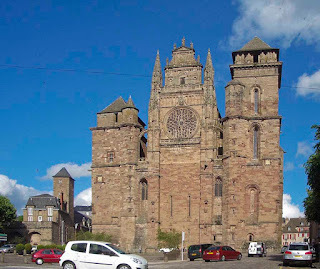 There is a huge puy in the center of town called Mons Anicius on which the Cathédrale Notre-Dame du Puy is built. Sundry mumbo-jumboists espouse fanciful fairy tales of the early Christianization of the site but, what does appear to be true, is that the striking church was first built in the early 12th century. Right outside of the campground was another astonishing sight - the Chapel Saint-Michel d'Aiguilhe (at left) poised atop a rocky needle of volcanic lava - all that remains of a long extinct volcanoes following eons of erosion. The chapel was built in 962 CE by Bishop Godescalc and a deacon named Trianus and is reached by climbing 268 steps carved in a spiral around the rock. The top of the rocky tower is 270 feet above the surrounding countryside with the chapel itself adding to that. 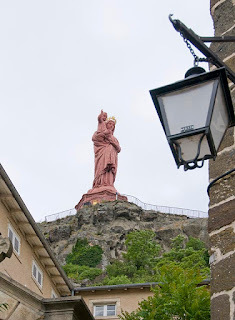 Le Puy had become a pilgrim destination as early as 500 CE and boasts a lengthy list of celebrated pilgrims over the the last 1500 years. It also developed into a major start point for the 1000 mile walk to Santiago de Compostela, a tradition that continues, supported by a daily blessing in the cathedral each morning to launch the day's participants on their way. 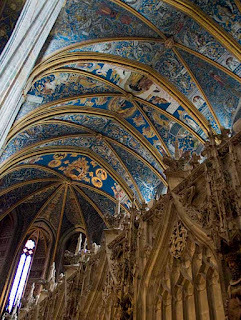 The cathedral has been a UNESCO World Heritage Site since 1998. More pictures of this unusual city here. 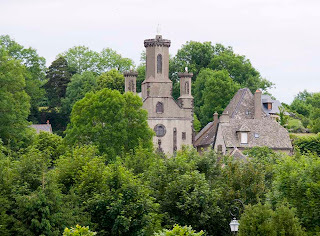 Twenty-five miles north of Aurillac, on the edge of the Cantal volcanic region and the Volcano National Park, lies the tiny town of Salers with a population of just 400. 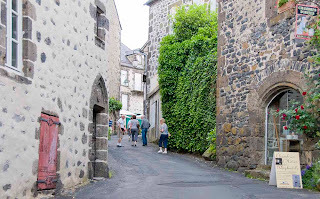 Although its history can be traced back for about 1,000 years, the town really came into its own in the 16th century following its appointment as a local administrative center for the highlands of the Auvergne and home of its magistrates in 1564. Most of the existing dark gray volcanic stone buildings were constructed in that era, many of them lavishly embellished. Seemingly frozen in time, Salers has seen few significant changes in the intervening centuries and is now an exceptional example of life and architecture as it was in the 16th century. The flip side sadly, is that the town has no viable means of support outside the exploitation of its past which it seems, it does quite successfully. An oblique claim to fame for the town is the Salers breed of cows. The main square in town, Place de Tyssandier d'Escous, is named for Ernest Tyssandier d'Escous, a 19th century veterinarian, who was central to the revival of the breed in the 19th century. A by product of this effort, is the officially recognized Salers cheese, a version of Cantal cheese and one of just five from the Auvergne region. More pictures of this historic town here. Aurillac is the little known and somewhat isolated capital of the Cantal department in the Auvergne region of south-central France. With a population of around 30,000, it is a mid-sized market town built along the Jourdanne River at about 2,000 feet altitude. 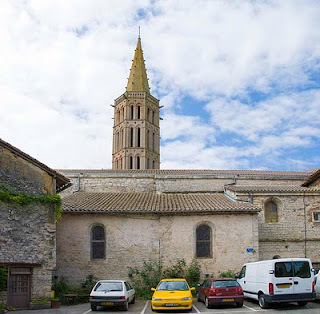 In the 9th century CE, Saint Geraud founded the Benedictine Abbey and, around the same time, houses were built on the city walls along the river. At the end of the 10th century, in 999 CE, a local lad, Gerbert d'Aurillac, became the first French Pope, Sylvester II, following his education in the Abbey. He only Poped for four years until his death in 1003 CE at the age of 57. While Aurillac can trace its origin back to the 1st century CE, it really didn't gain traction until it received its first charter around 1300 CE. In 1339 the Gothic style Notre-Dame-aux-Neiges was built on one corner of the of the Place de la Square. The town suffered a setback during the 16th century Religious Wars when a wholesale massacre of Huguenots (Protestants) was quickly countered by a the Huguenots sacking and burning much of the city while slaughtering Roman Catholics. Ain't Religion Great? In 1794, Aurillac was designated the capital of the Cantal department and, in 1850, it laid claim to the title of "Umbrella Capital" of France. As recently as 1999 it produced a quarter of a million parapluies - as many as were produced in the rest of France combined. Wow! Sadly, like stuffed toys and tee shirts, umbrellas are fast becoming the province of China and the industry in France seems doomed to an imminent demise. The historic remnants of the town comprise a small core of old streets, now largely pedestrianized, that has been given over to fashionable shops. 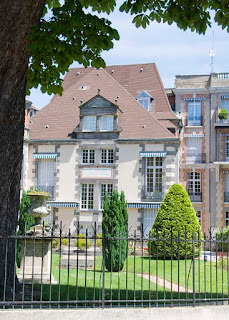 The homely Hôtel-de-Ville anchors the Wednesday and Saturday markets and is just a short walk away from Place St-Geraud with a small fountain and the unimpressive church of St-Geraud. Click here for more pictures about town. 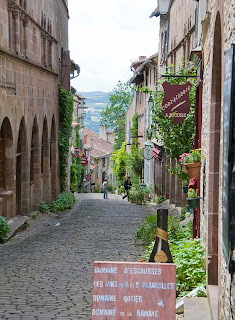 Today, Rodez is a quiet, almost genteel city in the Aveyron department of southern France. It wasn't always that way, however. As if surviving an outrageous gaggle of occupiers - Celts, Romans, Visigoths, Franks, Arabs, the Dukes of Aquitaine, the Counts of Toulouse and then the dreaded English - wasn't bad enough, in medieval times, rivalry between the Counts and the Bishops of Rodez literally split the city in two with a double wall. This curious condition continued to confuse the natives, but worse yet, in the early Middle Ages the Knights Templar took up residence and actually sold the town to partially finance their first crusade. Rodez is built high on a hill above the river Aveyron and the old city is dominated by its huge 13th to 16th century Cathedrale Notre Dame. This red sandstone building is an architectural icon in France and one of the first Gothic buildings to be built in southern France. The two main squares in the city, Place de la Cite and Place du Bourg, are connected by a network of medieval streets and alleyways, lined in parts with buildings from the 12th to 16th centuries. 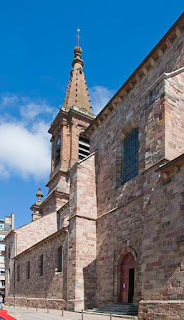 With a population of 24,000, Rodez hosts an open-air market in the square in front of the cathedral each Wednesday and Saturday morning and each Friday afternoon. Slideshow here. Cordes-sur-Ciel translates figuratively to Cordes in the Sky. The town adopted this name in 1993 in favor of plain old Cordes to give expression to the occasional appearance of the town jutting above the surrounding mist and, presumably, to pump up the tourist Euros. 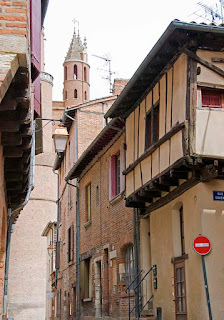 The town was founded in 1222 by Raymond VII, Count of Toulouse, and was among the first, if not the first, bastide to be built for refugees from the Cathar wars. 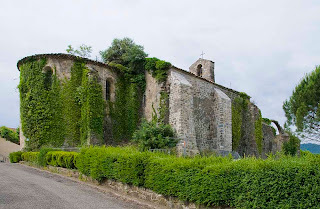 Built between 1222 and 1229 Cordes actually replaced the village of Saint-Marcel, which has been burnt down by Simon de Montfort and his gang in 1215. Following the Cathar period, which brought some unpleasant visits from the Papal Inquisition, Cordes enjoyed several generations of exceptional growth. As the bastide spread beyond its ramparts, the new suburbs were fortified until there w ere 5 rings of walls around the town. With textile, leather and finance industries booming, Cordes grew to more than 5,000 inhabitants. Today the population is a little over 1000. Many homes built within the original 13th century ramparts, escaped significant damage during the religious wars at the end of the 16th century and numerous examples of 13th and 14th century Gothic architecture remain today. A Cordes revival of sorts occurred following WWII, as a bunch of artists migrated to town, sundry poseurs bought up the chocolate-box picture houses for vacation homes and the heritage industry of tacky souvenir shops and expensive restaurants took over main street. Even so, Cordes sur Ciel was well worth the visit with lots to gawk at. See here for more pictures. Considered to be one of the most beautiful villages in France, the tiny fortified market town of Bruniquel, with its 561 inhabitants is built on a cliff overlooking the river Aveyron. A second river, the Vère, flows northward through the commune, before flowing into the Aveyron. Most of the residences are built of pinkish stone with half timbered facades, some dating from as early as the 14th century. Yesteryear prosperity of the village is evidenced by numerous decorated turrets, sculptured stone doorways and carved figures. 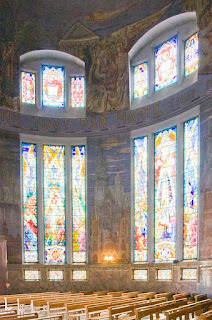 Saint Maffre church, destroyed during the religious wars, was rebuilt in the 17th century and updated in the 19th. There are still a few vestiges of the defensive wall around the town. The medieval prosperity enjoyed by Bruniquel resulted from its location as a crossing point for merchants and a stopover for pilgrims on their way to Santiago de Compostela. Many such visitors stayed at the hospital Saint Catherine, opened in 1303. At the very top of the town there is not one, but two castles, perched on the edge of a cliff and looking down over the town. The older of these was built in the 12th century on the ruins of a 6th century fortress constructed by Queen Brunehaut (534-613 CE), daughter of the Visigoth King Athanalgilde. William of Tudela was an early occupant of this castle which remained occupied on and off until the 20th century. In the 15th century, another castle wa s built right next door and was then occupied for about 200 years. Currently it houses the "Treasures of Bruniquel", a collection of prehistoric artifacts found in nearby caves. There is apparently evidence of Neanderthal activity in the area and to my mind this was confirmed beyond doubt in 1991, when a group of do-gooder graffiti cleaners power-washed a number cave paintings to oblivion. Click here for slide show. Our trusty campsite locator had directed us to Camping le Clos Lalande close to the tiny village of Montricoux. 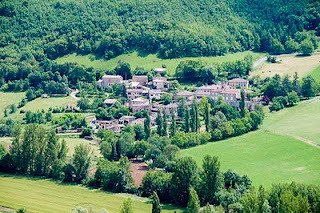 Montricoux is a commune in the Tarn-et-Garonne department in the Midi-Pyrénées region of southern France with a population of just 1041. We had been on a pretty hectic schedule for a while so we decided to spend two nights at le Clos Lalande for a little R&R. We used the rest day to check out the village which ended up being a relaxing walkabout in excellent weather. Later in the day, we realized that this was also our 48th wedding anniversary. Hey Ho. For some pictures of Montricoux and the camp site, click here. There are numerous definitions of a bastide, several explanations of their origins and purpose and numerous contradictions about the nature of their design. Great stuff for historians to write endless dissertations and bicker among themselves, but what does it all mean for the hapless tourist seeking his next titillation? Not very much we decided. Thankfully, there are a number of attributes that practically all "authorities" do agree on, one of which is that bastides are scattered across southwestern France from the Mediterranean Languedoc region to the Atlantic Aquitaine. It is also pretty certain that there are between 500 and 700 extant examples and that they were all built between 1200 CE and 1400 CE with most, but not all, being on hilltops. Other common threads include small populations - usually less than 1000 - and that the vast majority are now fortified, although many that were built before the Hundred Years War commenced did not originally possess defensive properties. 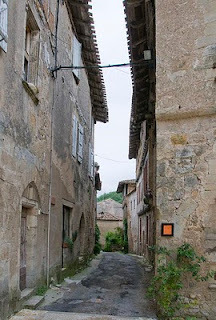 These tiny towns were built both by the French and the English, often at the site of an existing community and occasionally in the middle of nowhere. As much as anything, this was an effort on the part of each nation, to colonize the wilderness areas of southwest France and to establish a more modern society. The latter was accomplished by inducing peasants out of serfdom and making them free men with small land grants along with the privilege of paying taxes. Side effects of the concentration of population areas were the benefits of developing trading posts and markets which were more easily defended than the previously scattered or non-existent communities. 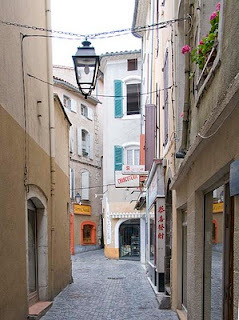 A typical bastide layout might include a central square, an adjacent church and a grid like pattern of steeply inclined streets. While many bastides have already vanished and most of the remainder seem moribund, they have captured the imagination of the tourist industry in latter years and this influx of visitors (and money) could extend their existence for years to come. 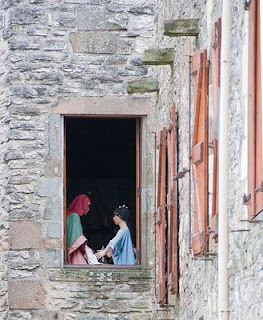 Our purpose, while in this part of France, was to visit some of these historic villages to see for ourselves. More pictures here. Although the Romans conquered this area of Gaul (as it was then) in 51 BCE, it seems that they never really put down roots in Albi. After the demise of the Roman Empire, this entire region, nowadays part of France, enjoyed great independence from outside interference. By the 11th century Albi was very prosperous and, after opening the Pont Vieux connecting to the north bank of the river Tarn, enjoyed a further rapid spurt of trade. During this time, the Cathars, who dominated the regions religion, had developed their own version of Christianity - a big Catholic No-No at the time - and, in 1208, the Pope and the French King ganged up to root out the infidels. The subsequent Draconian housecleaning gutted the region to the extent that left annexation by France the only viable way forward. 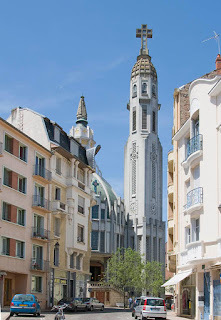 This period of upheaval and repression left the local Bishops none to popular and, in their p aranoia, they morphed their little housing complex into the massive fortified Palais de la Berbie and, when this was done, ordered the building of the massive cathedral of Sainte-Cécile in 1282. This colossus of a church was almost 200 years in the building and now sports the Dominique de Florence doorway sheltered by a fabulous Baldaquin and set off with a 260 feet high bell tower. 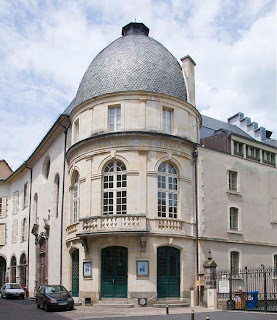 Today, the Palais de la Berbie is the Toulouse-Lautrec Museum, housing more than 1000 of the artist's works, including the 31 famous posters, and is one of the oldest and best-preserved castles in France. Pont Vieux - the Old Bridge - with its 8 arches and 500 feet span, remains in daily use after almost 1000 years of service. See here for more pictures. There are actually two Carcassonnes; an early city contained within a hilltop fort and known as the Cité, and the later ville basse, or lower city, across the River Aude. 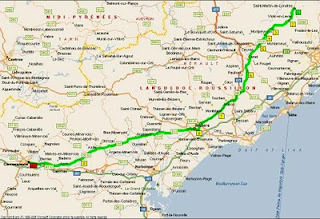 Both cities are in what is now the Languedoc-Roussillon Region of southern France. Signs of settlement in the area date to 3500 BCE and, by the 6th century BCE, the hilltop community had become a successful trading site. In due time, the Romans made their appearance and began the fortification by building the lower courses of the ramparts. In 462 CE however, the Romans ceded the entire region to the Visigothic king Theodoric II, who had actually held Carcassonne since 453. Theodoric extended the fortifications. In 1067, Raimond Bernard Trencavel, Viscount of Albi and Nîmes, married into the family of the Count of Carcassonne and, in the following centuries, the Trencavel family allegiance flip-flopped between the Counts of Barcelona and the Counts of Toulouse. 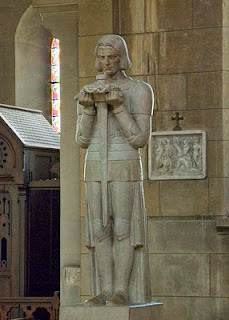 Next up was Simon de Montfort. He stopped by in 1209, conquered the city, forced the citizens to surrender, captured Raymond-Roger de Trencavel who was subsequently disposed of and promptly appointed himself the new Viscount. 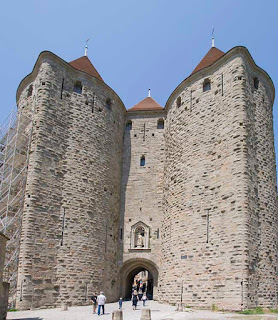 Simon added further fortifications as Carcassonne had by now became a border citadel between France and the kingdom of Aragon, current day Spain. 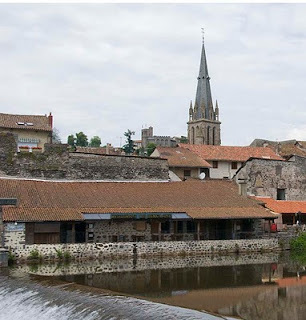 Ultimately, in 1247, the city submitted to the rule of the kingdom of France and King Louis IX founded the new part of the town across the river. 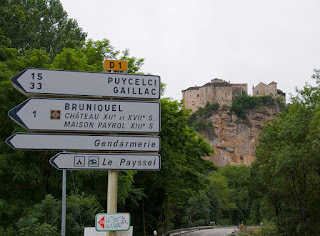 In 1659, the Treaty of the Pyrenees transferred the border province of Roussillon to France, creating the current Languedoc-Roussillon and effectively moving Carcassone well away from the Spanish border. Its military significance thus reduced, the fortifications were abandoned and the city became an economic center for woolen textiles. 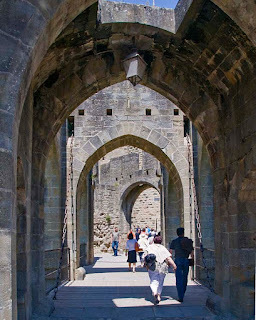 During the Restoration, Napoleon removed Carcassonne from the official list of fortifications and the Cité deteriorated to such an extent that the government issued a decree in 1849 to demolish it. The following uproar led to a campaign to preserve the fortress as a historical monument culminating with the architect Eugène Viollet-le-Duc being commissioned to renovate the place. Work began in 1853 and the result was belatedly designated a UNESCO World Heritage Site in 1997 even though Viollet-le-Duc, fresh from work in the north of France, mistakenly used slates and rebuilt the roofs as pointed cones, rather than local practice of low pitched tile roofing, more suitable for a snow-free environment. The restored fortifications comprise a double ring of ramparts with 53 towers. 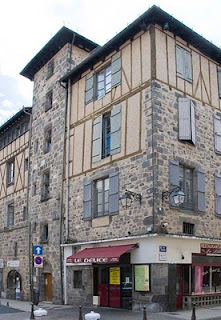 Ville basse, the "modern" city of Carcassone, today manufactures shoes, rubber and textiles but a major part of its income derives from the three million visitors received by the Cité each year. 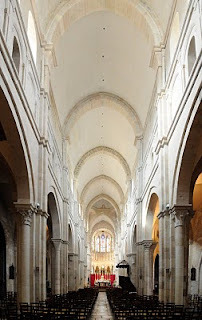 The Basilica of St. Nazaire and St. Celse in the Cité was the area cathedral until 1801 at which time it was demoted in favor of the Cathédrale Saint-Michel de Carcassonne in the ville basse. 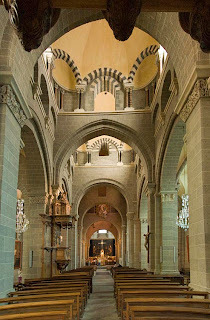 An 11th century Romanesque structure consecrated by Pope Urban II in 1096, the exterior was largely renewed by Viollet-le-Duc, while the interior has retained its original Gothic style. The current Carcassonne cathedral in ville basse, the Cathédrale Saint-Michel de Carcassonne, was built in the thirteenth-century as a parish church and rebuilt as a fortified church following war damage in the 14th century. More picture of both Carcassonnes here. We stayed at a rather seedy campsite just a short bicycle ride away from Saint Martin de Londres. 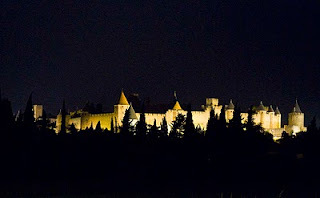 The following day, we headed to Carcassonne which was to be the most south-westerly point of our tour. As usual, we stayed off of the freeways (Autoroutes) and meandered mainly along "D" roads. The total journey for the day was less than 100 miles (nonetheless, as much as we generally seek to do) and we passed through numerous villages and one large town. The pictures for this post illustrate elements of some of the villages and the roads connecting them. 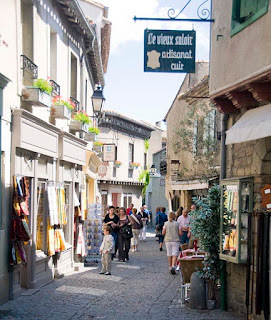 Click here for a short journey through southern France. 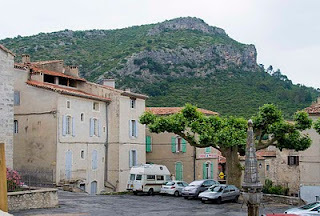 Saint Martin de Londres - literally Saint Martin of London - is a village of less than 2000 people located in the scrub-land north of Montpelier and close to the cliffs of Pic Saint Loup. In late 8th and early 9th centuries, during the reign of Charlemagne, the community built the original church dedicated to Saint Martin, a Saint "borrowed" from London, England. 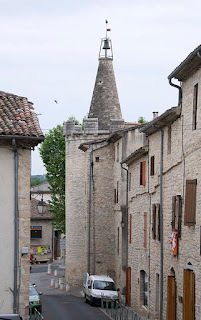 There is a small bell, housed in a lantern on the slate roof of the church and this was augmented by a high bell bay added in the 18th century.In the 11th century the monks of the Abbey Gellone (Saint Guilhem) built the priory and defensive walls were erected around the town. Later, during the Hundred Year War in the 15th century, a second wall was added. In the lower part of the town the clock tower is one remnant of the medieval walls, and is topped by a conical turret forming the bell housing. Click here for more pictures of St Martin. The National Park of Cevannes is 30 or 40 miles north of the Mediterranean coast in the Languedoc-Roussillon region of southern France. 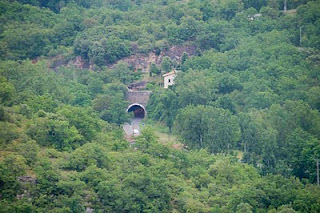 This hilly area is part of the Massif Centrale range and is largely the domain of wild boars and hikers. The river Gardon d'Anduze flows down one of the steep valleys and the little town of Anduze, population 3000, is perched on its bank. In addition to the obligatory narrow streets, lined with medieval houses and a handful of interesting squares, there is a 1320 CE clock tower, remnants of the original defensive ramparts and a grain hall dating from the 15th century. With a curious pagoda-fountain dating from the 17th century thrown in for good measure, Anduze is a great place to walk around. Our visit was marked by intermittent rain and cool temperatures but was nonetheless hugely enjoyed. 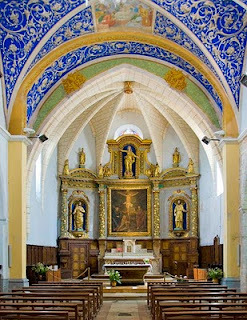 The history of Anduze is forever entwined with the Protestant cause in the ferocious 16th and 17th century Religious Wars that effectively split France. The Duc de Rohan led a group of Protestant force in the area around 1625. and much of this ignominious period is memorialized in a museum in the nearby village of Le Mas Soubeyran. Take a picture tour right here. Overnight, we had stopped at a neat site northwest of Ales, near the commune of Centras. Centras has a population of less than 2000 and is another declining backwater village with high unemployment and few accessible prospects for its inhabitants. 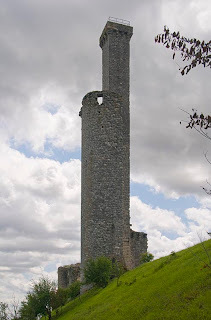 From as far back as 1230 Centras was a coal mining town and the Benedictine Monastery, founded there in 950 CE, was running an infirmary for the miners by the early 13th century. Mining has long since ceased and nothing has taken its place while in the meantime, mechanization has reduced the labor required for farming. The population peaked at almost 2,800 in 1968 and has steadily declined since that time. Short slide-show here.